FILE - Farmers plant rice in Samroang Teav village on the outskirts of Phnom Penh, Cambodia, Aug. 23, 2015. Cambodians are expecting a 'seamless transition' when the ASEAN Economic Community (AEC) is launched in two months and hopefully heralds a second investment wave, capable of transforming this country's pool of unskilled labor into a manufacturing hub. Cambodians are expecting a 'seamless transition' when the ASEAN Economic Community (AEC) is launched in two months and hopefully heralds a second investment wave, capable of transforming this country's pool of unskilled labor into a manufacturing hub. The first investment wave followed Cambodia's ascension to the World Trade Organization (WTO) in 2004 and gave this country's hopelessly war ­torn and almost nonexistent economy a lift with the garment and tourism industries, and big spending on infrastructure that followed. Sok Siphana, a senior government advisor, said neighboring countries Thailand and Vietnam would continue to be the big producers of cars and white goods, but Cambodia would get its chance to emerge as a key manufacturer of smaller components and parts like electrical harnesses. “I think for Cambodia the economy is already wide open, as a matter of fact. Since we acceded to the WTO, we made tremendous economic liberalization already, so to me the AEC is a welcoming sign of a second wave of investment that will come to the country,” he said. This, Sok Siphana added, would lead to further investment in Special Economic Zones (SEZ) with foreign investors taking advantage of a unique Cambodian law, which allows them to own 100 percent of their in­country companies. That compares with a maximum 70 percent foreign ownership elsewhere in the AEC. Cambodia, and in particular Chinese and Japanese donors, have spent huge sums on dual lane carriageways, bridges, port expansions and rail networks to take advantage of its strategic position within the trading bloc of 610 million people. 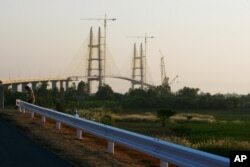 FILE - Cambodia's longest bridge is seen under construction before it is inaugurated in Neak Loeung, southeast of Phnom Penh, Jan. 14, 2015. At the broader bureaucratic level, the AEC will harmonize laws and remove barriers on cross-border trade for the 10 countries within the Association of South East Asian Nations (ASEAN) from January 1 next year. ASEAN would be the world's seventh largest economy, if a country, with a GDP of $2.4 trillion. Eight professions -­­ doctors, nurses, dentists, engineering, architects, surveying, accountancy and tourism - will lead ASEAN into its free trade zone. Cambodia was expected to do well with tourism, but lag in others, particularly where internationally recognized skills are required. Cambodia-based American lawyer Brett Sciaroni said extra spending on education and vocational training would bridge that gap over the medium to longer term, while laws needed to be amended to attract foreign investors and improve the standing SEZs within the bloc. “We have always touted Cambodia as being a key country in the region and as the infrastructure projects continue on the road networks, the railways and so on we'll become more central and more critical for the transit of goods and people,” he said. Sciaroni and Sok Siphana said the major fear for the Cambodian economy over the longer term is rival trade blocs, in particular the Trans Pacific Partnership (TPP) with the likes of the U.S., Vietnam and Malaysia as members, but not Cambodia, Thailand, Laos or China. “I think the real danger for Cambodia in the out years are the other trade agreements going on like the Trans Pacific Partnership where we're not included but some of our neighbors are, so I think countries like Vietnam will get a boost from TPP and I think that we need to take a closer look at some of these other regional trade agreements,” said Sciaroni. Other benefits were also expected to follow the AEC launch. Independent political analyst Ou Virak said fewer border restrictions, the freer movement of people and improved job opportunities should cut back demand for human traffickers and people smugglers, and help push them out of business.